The United States Agency for International Development (USAID) has awarded a $24 million grant to the Coastal Resources Center (CRC) at the University of Rhode Island’s Graduate School of Oceanography to lead a five-year sustainable fisheries project in Ghana, West Africa. The grant is the largest in URI history. The objective of the USAID/Ghana Sustainable Fisheries Management Project is to rebuild key marine fisheries stocks through responsible fishing practices. Ghanaian fishing boats return to their village to unload their catch. 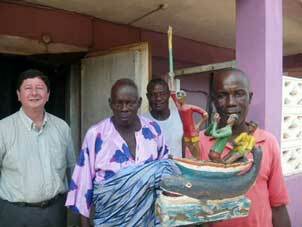 The project is part of USAID’s Feed the Future Initiative and will meet the government of Ghana’s fisheries development objectives. Working closely with the Ministry of Fisheries and Aquaculture Development and the Ghana Fisheries Commission, the project seeks to end overfishing of stocks important to local food security. It will accomplish this by working to ensure a legal framework exists for adoption of management plans that give use rights to the fishermen/women; ensuring decisions affecting fisheries and ecosystems are based on strong science; and widely communicating knowledge and information that educates the public and policy makers, so that support for lasting change emerges. More than 100,000 men and women involved in the local fishing industry are expected to benefit from this project. Included will be tens of thousands of women involved in the processing and marketing of smoked fish. In leading this project, CRC will work with a consortium of international and local partners, including SNV Netherlands Development Organization, SSG Advisors, Hen Mpoano, Friends of the Nation, the Central & Western Fish Mongers Improvement Association in Ghana, Daasgift Quality Foundation, Development Action Association, and Spatial Solutions. Included in project activities will be efforts to reduce child labor and trafficking in the fisheries sector in the Central Region of Ghana. The project also includes a university strengthening component with the University of Cape Coast to improve their applied research and extension services in coastal and fisheries management.